Well friends I guess you guessed it. I broke my left thumb over at the house Saturday. Check it out. 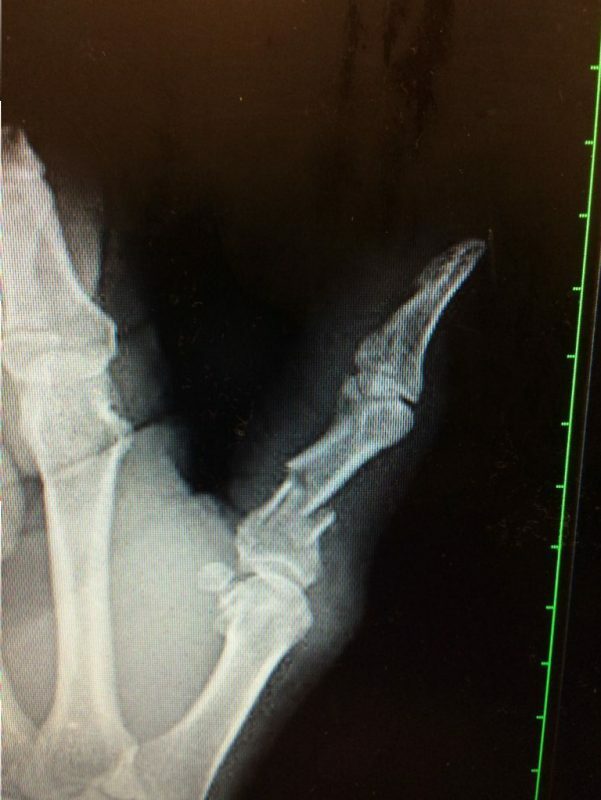 X-ray of my left thumb. Yeah I gave it quite a shot. We’ll talk about that later though. Welcome friends to the never ending saga of Hobbit Hollow. It’s just a flesh wound people. I’m not going to let a broken thumb slow down this fine builder of Hobbit homes. Anyway I hope all is well in your part of the world. This winter in the Northeast hasn’t been too bad thus far. Not to cold not much snow. I’m glad you all stopped by to check things out. It’s funny how things happen sometimes. Right? Okay, maybe not funny but interestingly weird. I really didn’t get into it in the last post but we had a major problem over at my job at 220 Central Park South. 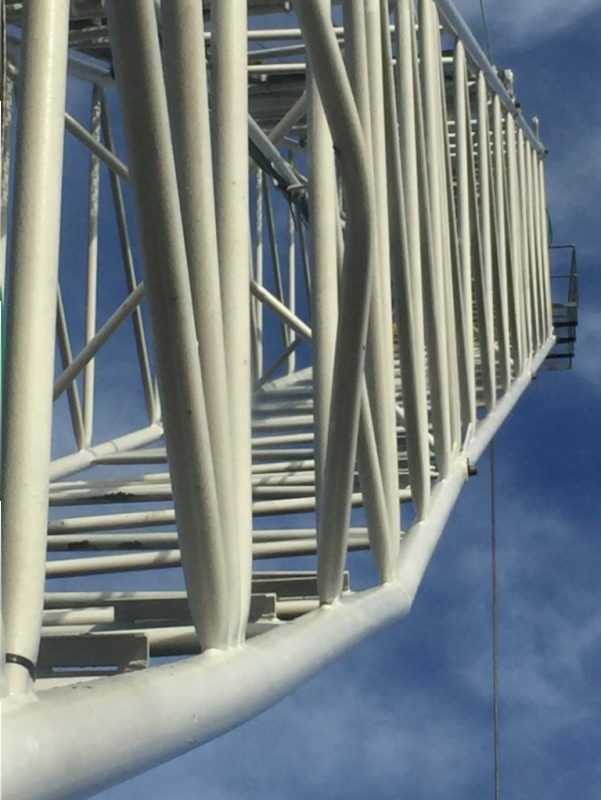 The crane operator boomed the crane up to far and hit what they call the “boom stops.” When that happened the lacings on the crane buckled and the main chords supporting the boom structure deformed. Obviously we had to shut the crane down and figure out how to fix it. Remember this thing is about 1000 feet up in the air. So it’s really not like working on something on your garage workbench….and if anything falls off the crane while your doing the work you could literally kill someone below. So it’s pretty serious. The New York City building department didn’t help either. They’re never in a hurry for anything. Put it to you this way. We got the parts to fix the crane in I think three days. Built the working platform, repaired it, and then took down the working platform in three days. 6 days total. We were shut down for five weeks…….that’s a long time. Even for New York City standards. Let me show you a picture of the bent lacing so you can see what we were up against. So everyone at work knew it was coming. This underlying dread that you live with while you wait for the call. “The Donald.” Did I say that I wouldn’t get political last week? Hmmm. I think I did. Okay let’s move on. Where was I. Oh yeah the dread. So the owner of the building at 220 CPS (Central Park South) wants to know how we are going to make up the lost 5 weeks. Oh boy. You guessed it. We need you to start working Saturdays! Just what everyone wanted to hear. So the irony is that I’m not going to be able to work on the Hobbit House for the next 8 or nine weeks anyway because I have to work in the city. Hopefully that will cover the healing process. From what I’ve read the thumb should heal in 6 to 10 weeks. He works in mysterious ways does he not? Back to Saturday: The Beginning. …..and the Lord said let there be light! Knock it off will ya. So the main focus of the days work was going to be frameing repair and replacement. Sort of like “Repeal and Replace.” If your catching my drift. But we’re not going to go there. Right Jim. Proceed will you for God’s sake. 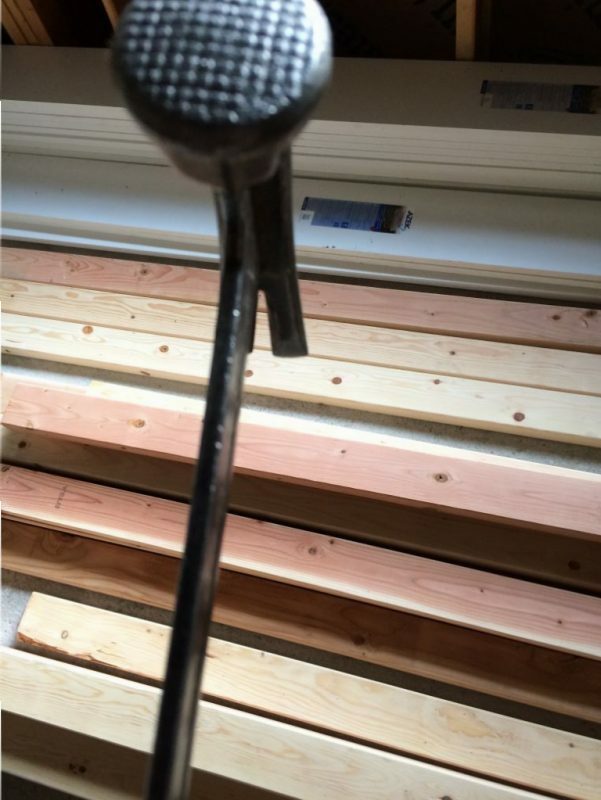 So I had Terence and Peter begin the the finish framing routine. I needed to be involved with that a bit because there actually was a lot of tricky stuff involved with it. 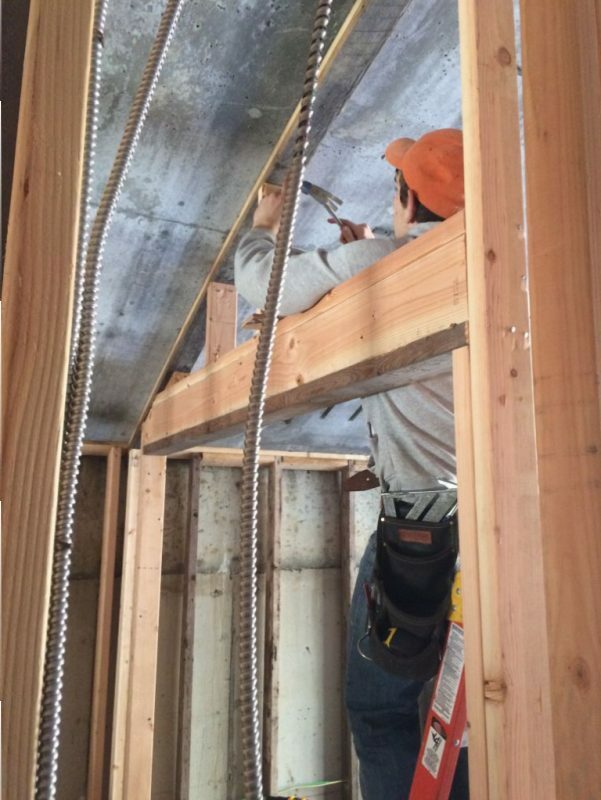 We started out framing the closet door headers in the two bedrooms. Terence marking out for the cripple studs over the door header. 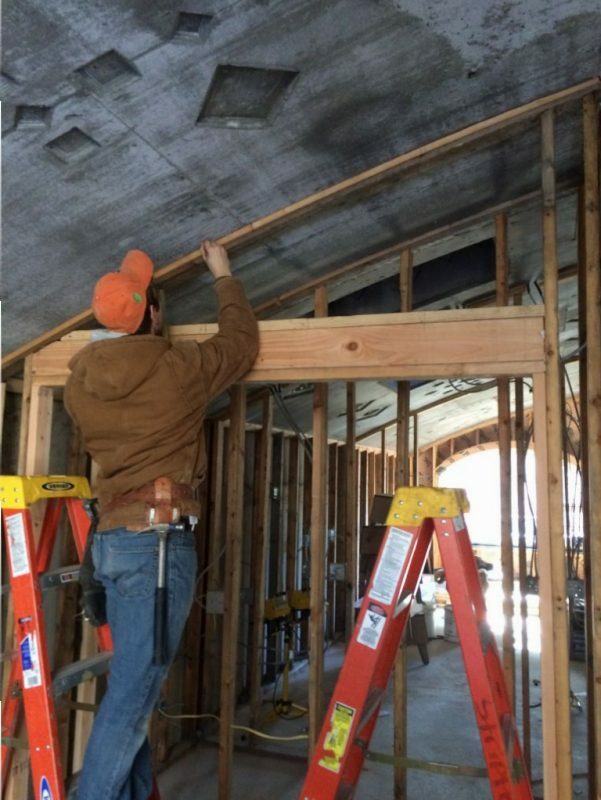 We started out fixing the rough openings and making the header over the door. If you look to the left there you can see how we cut the header to fit the ceiling plates. The header isn’t really load bearing. This means that the studs that are on top of the header won’t be transferring any load from above to the header. They’re there for sheet rock purposes only. Hobbit Houses really are cool aren’t they? Once we had the header in place and marked out for the cripple studs it was a simple matter to just cut and fit everything into place. Terence installing cripple studs over the bedroom closet door. 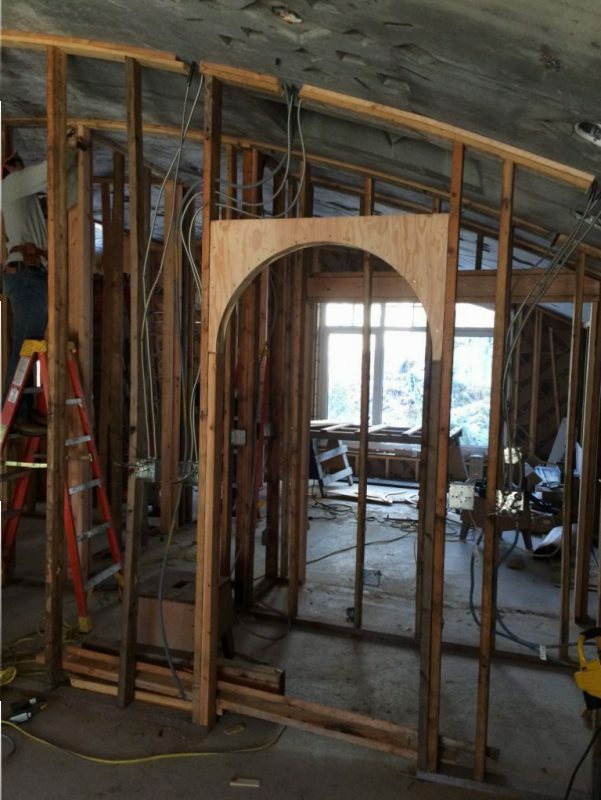 While Terence and Peter were working on that I started the archway openings into the kitchen. In the “Fellowship of the Ring” there is this scene where Gandalf walks through a narrow arched doorway that I always thought was really cool. I wanted to put something like that into the house. So the opening at the kitchen that leads to the central hallway in the house I wanted narrow.In the movie Gandalf has to duck under it to get through the opening. We can’t have that but I think I kept it low enough to get the right feel of things. So I’ve never done any framing like this before but my thoughts were just trace the arch on plywood, fir it out and hold it up with a couple of jack studs. I picked up two sheets of 1/2 inch underlayment from the lumber yard and proceeded to layout my arch. First the centerline and the width of the opening. Then I used a strip of plywood with a nail in it to scribe my arch. Here’s my drawing board. 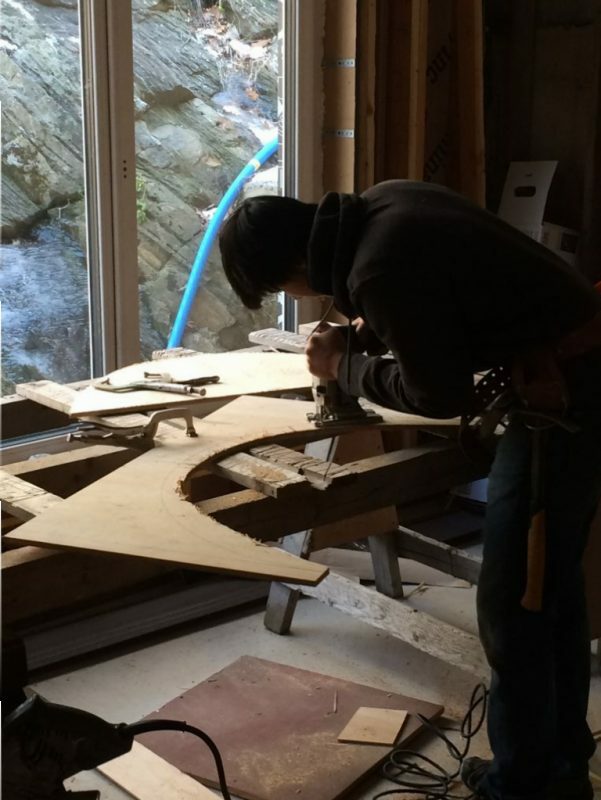 Drawing the doorway arch on plywood. Using a jigsaw I had Peter cut out the circle. Peter cutting out the circle. I don’t know if you can see it but I cut most of the wood back on the circle with a skill saw first. It makes it a little easier to use the jigsaw. Once we had the two templates made I sandwiched 2×3’s between them to make a frame. 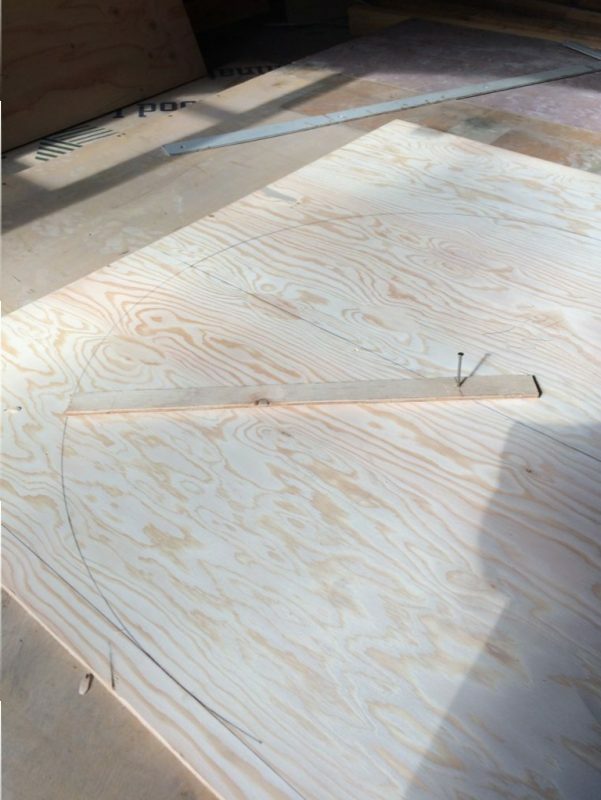 The two pieces of plywood and the two by three make up three and a half inches which is the width of the stud wall. Pretty simple. It was a cinch to install it. The only thing I have left is a stud or two over the door for sheetrock purposes. I cut the new ones and started to nail them in place with 10 penny nails. 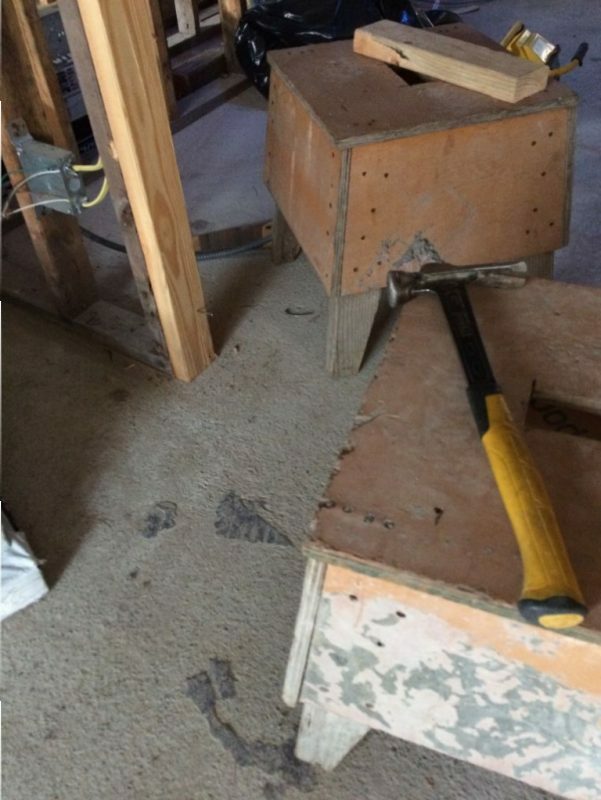 As I was working my way down the stud nailing every 12-16 inches or so I swung my hammer back and as I started my forward motion the hammer hit the step stool next to me and altered the direction of my swing. 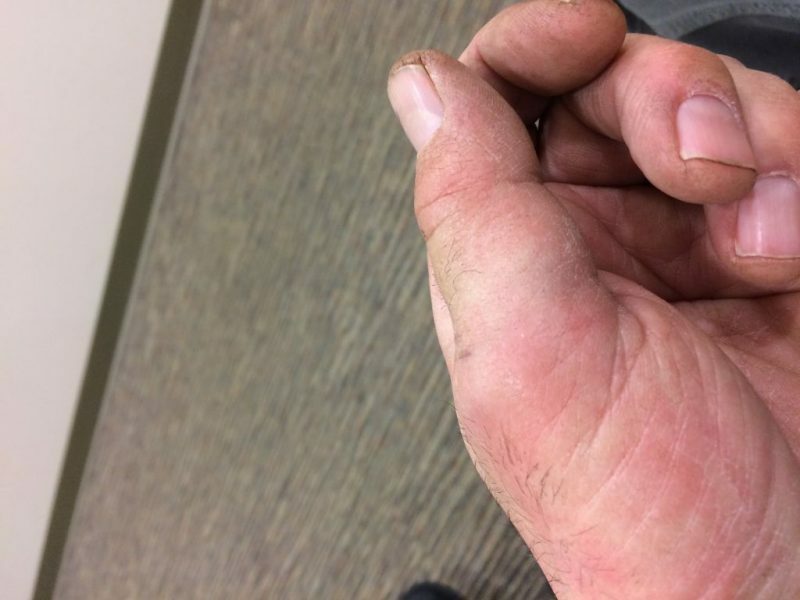 the shaft of the hammer went directly between the two knuckles of my thumb and snapped my bone right in two. It was one of those moments when as soon as the incident happens you know that your plans for the day are about to change. And change they did. I put my finger on a piece of wood and straighten it out so that it resembled the thumb that I previously had. Then I told the boys to wrap up and went to urgent care. Haste makes waste people. It certainly does. I stopped home before I went over to Urgent care and got an ice pack for my thumb. Kind of a weird thing. It never really hurt. I thought that at some point it would start to be painful but that never happened. I think the doctor did a good job of bandaging things up. I have to call the orthopedist on Monday and schedule a visit. This is going to be a pain in the neck. Oh well. Morale of the story: Make sure there is nothing in the way of your swing, and don’t rush. A couple of images for the road. If you look close you can see the nail at the bottom of the 2×4 that I was in the process of hitting in. Someone please tell me why in the hell I didn’t move that damned bench???? That’s the shaft that broke my bone. Of the Final Window and the Fixing of Framing…. If it makes you feel any better, one of my kids broke his little finger when he tripped over a crack in the sidewalk. Literally. Just a little expansion joint. Yeah every little bit helps. Had to go into work this Saturday. Maybe next weekend as well. We’ll see what happens. Thanks again. Sorry to read about the thumb and all the NYC drama. Snow don’t help neither. The 220 CPS pictures are incredible. I get vertigo looking at the heights! Oh, last Friday, the JFK group (more folks than last time) got together again at some bar in Brewster that has a mechanical bull. (I’m in Florida, so couldn’t attend). Tony Pauline sends me a picture of the 1 person riding the bull. Of course, it’s Al ! Hey Mike! Thanks for writing. Yeah the thumb thing is a bummer. Al did text me about going out but I was too busy and tired. Let me know when you’re up again.